Posted by Laura Arnold in Indiana Utility Regulatory Commission (IURC). Former Indiana Utility Regulatory Commission chief David Hardy and the state’s then-finance director, Jennifer Alvey, improperly discussed the merits of a $6.9 billion contract the Indiana Finance Authority ultimately struck with operators of the Indiana Gasification plant proposed for Rockport, plant opponents alleged Monday. Former Indiana Utility Regulatory Commission chief David Hardy and the state’s then-finance director, Jennifer Alvey, in 2009 and 2010 secretly and improperly discussed the merits of a $6.9 billion contract the Indiana Finance Authority ultimately struck with operators of a proposed gasification plant, plant opponents allege. Citizens Action Coalition, the Sierra Club and other environmental groups on Monday presented copies of the e-mail to the commission, which is reviewing whether to approve the project agreement. The environmental groups are on record as opposing the plant. Such direct, behind-the-scenes communication in such regulatory matters is generally prohibited under state law. The e-mails show the agency heads discussing the plant as far back as 2009. “The materials raise due-process concerns and provide evidence of communications that would, to a reasonable person, raise serious questions regarding whether the commission’s impartiality has been compromised in this matter by the advisory role to (the Indiana Finance Authority) in the negotiations,” according to the filing CAC attorney Jerome Polk made Monday with the IURC. However, IURC administrative law judge Angela Webber denied a request to delay the hearing for 30 days, despite the e-mails. She ruled that the e-mails were sent more than 30 days prior to the December 2010 filing of the gasification plant case, and they were “procedural and general in nature” rather than substantive. CAC has until May 13 to offer rebuttal in the case, Olson said. The IFA plans to purchase synthetic natural gas from the plant over 30 years, which proponents—including would-be plant operator Leucadia National Corp. of New York—have said will save Indiana gas customers more than $100 million by locking in low rates. But the e-mails obtained by CAC raise serious questions about improprieties, as well as whether the contact had the blessings of Indiana Gov. Mitch Daniels’ staff. 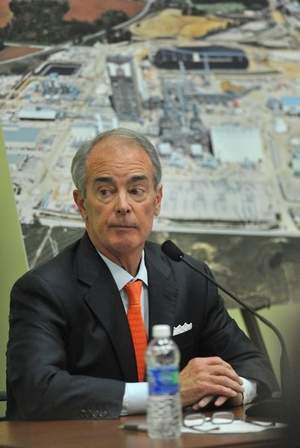 Daniels has been a supporter of the $2.7 billion gasification plant as part of his “homegrown energy” policy. Under one of the e-mails obtained by CAC, Alvey appeared to confirm that Daniels adviser David Pippen provided then-IURC chair Hardy with “the run down” on negotiations the state was having with Leucadia. “I’m preparing for maternity leave but wanted to give you a quick update. Pippen said he gave you the run down that we are holding unless we get some more movement on the guaranteed savings,” read a copy of an e-mail Alvey sent Hardy on Oct. 30, 2009, referring to the negotiations between IFA and Leucadia. In another e-mail, Alvey tells Hardy about efforts to get favorable legislation for the deal involving IFA’s agreement with Leucadia. Polk said such adjudications may not be made upon information received. Olson told the commission Monday that he met with Alvey in late September 2010, and she indicated then that she had not talked to commission officials about the IFA’s proposed synthetic natural gas contracts with Leucadia’s Indiana Gasification. But she said she “was anxious to go across the street and start the process,” Olson said. “This was not a competitive and public process,” he said. Alvey left her position early this year for a job in the private sector. Gov. Mitch Daniels fired Hardy last year in a separate ethics matter after learning that the IURC’s chief attorney, Scott Storms, was presiding over Duke Energy cases even as he was talking to the utility about a job, which he later accepted. He and the head of Duke’s Indiana operations were later fired by Duke when the scandal came to light. Incriminating e-mails showed that Hardy was aware of Storms’ job-seeking and that he made light of a state ethics commission review of whether Storms had a conflict of interest. Posted by Laura Arnold in Indiana Utility Regulatory Commission (IURC), Uncategorized. Source for article reprinted below. State reaches deal on coal gasification plant – CNBC. INDIANAPOLIS – The state’s finance authority said Thursday that it reached a 30-year deal to buy synthetic natural gas from a coal-gasification plant planned for southern Indiana, marking the first time the state has entered into such a venture. Opponents called the deal an entitlement program and “socialism for corporations,” but Republican Gov. Mitch Daniels said the deal will save Indiana’s natural gas users money by locking in low rates and ensuring a steady supply of synthetic natural gas made from Indiana coal. Under the deal, the Indiana Finance Authority will spend an estimated $6.9 billion over 30 years to buy synthetic natural gas from Indiana Gasification LLC, a subsidiary of Leucadia National Corporation. The IFA will buy the gas once production begins — as early as 2015 — and will then sell the synthetic gas to the market, where it will be delivered to consumers through existing utilities. If contract prices are lower than market prices, the savings will be split between the company and ratepayers. If contract prices are higher than market prices, ratepayers would be protected by $150 million set aside by the company to cover higher prices. The company will be responsible for building the $2.65 billion plant planned for the Ohio River town of Rockport in Spencer County. The state would share in profits from byproducts of the coal-gasification process such as sulfuric acid and rare gasses, and the company would give Indiana vitreous slag for free, a byproduct that can be used to build roads. Officials said Indiana Gasification assumes all the risk for construction of the plant and its operations — so if the plant is not built or does not end up producing synthetic natural gas as planned, the state is not out anything. “There’s no risk to us,” said Jennifer Alvey, the state’s public finance director. But Kerwin Olson, the program director for the Citizens Action Coalition of Indiana, questioned why the state needed to get involved at all. “The state is delivering Leucadia a market to which they are not entitled,” he wrote. Alvey said the finance authority’s involvement would mean all natural gas users in Indiana would benefit, not just those from one utility company who might choose to buy the synthetic natural gas. Daniels pointed out that the contract allows the state to direct the gas for use wherever it deems necessary in a state of emergency, meaning the state could still get natural gas even if supplies were interrupted elsewhere because of a hurricane, act of terrorism or other event. The governor’s office estimates that the plant — first talked about in 2006 — would create 1,000 construction jobs, 200 full-time jobs at the plan and 300 mining jobs. The roundabout method of using the finance authority as an intermediary partner between the state’s gas utilities and the coal-gasification plant was created after utilities dropped out of negotiations for the synthetic gas contracts in 2008 amid concerns the long contracts would harm their credit. In 2009, the Indiana General Assembly passed a law that allowed the finance authority to negotiate long-term contracts with the plant, which would turn coal into synthetic natural gas, stripping it of pollutants and carbon dioxide to create a gas similar to real natural gas. Now that the finance authority has completed negotiations, it will file a petition with the Indiana Utility Regulatory Commission for approval of the project agreements. Indiana Gasification is negotiating a loan guarantee with the U.S. Department of Energy, and an environmental impact study must be done. Depending on the timing of those elements, construction of the plant could begin in early 2012. Indianapolis, Ind. — The Indiana Utility Regulatory Commission (IURC) today approved a settlement agreement reached by Northern Indiana Public Service Company (NIPSCO), the Indiana Office of Utility Consumer Counselor (OUCC) and other key customer stakeholders to resolve NIPSCO’s pending natural gas rate case. The settlement – filed on Aug. 24 – was also signed and agreed upon by the NIPSCO Industrial Group, the NIPSCO Marketer Group and Citizens Action Coalition of Indiana. The settlement slightly decreases overall rates for all NIPSCO natural gas customer classes while providing continued strong support for low-income customer assistance, energy efficiency and conservation programs. The newly approved gas base rates should be implemented in the November billing cycle and will be reflected in the gas delivery portion of customer bills. The settlement delivers not only lower rates but also new customer assistance programs to be in place for the current winter heating season. NIPSCO will reduce its overall natural gas rates by $14.8 million, based on a $5 million reduction for residential customers and a $9.8 million reduction for commercial and industrial customers. For NIPSCO’s 660,000 residential natural gas customers, the reduction equates to a savings of approximately $7.50 annually per customer. Rates for commercial and industrial classes will also be lower. NIPSCO will adjust its rate design for the residential class to reduce seasonal volatility in customer bills and support energy conservation. This change helps separate fixed monthly service costs from variable, usage-driven costs, allowing customers to better track and manage energy usage. This design will result in an increase to the utility’s monthly gas delivery/service charge from $6.36 to $11.00. However, reductions to the base rate’s volumetric charges will offset the change in the flat monthly delivery/service charge, especially during the winter months. NIPSCO will revise its low-income customer assistance program to make it similar in design to the Universal Service Program currently in place for Citizens Gas and Vectren Energy Delivery, and at the same funding level it contributes to the current Winter Warmth program. NIPSCO will contribute 25 percent of the program’s costs, which under current usage levels total approximately $1.5 million. The first $500,000 of NIPSCO’s funding will be used to continue a hardship program for non-eligible Low-Income Home Energy Assistance Program customers. NIPSCO will continue to offer a variety of natural gas energy efficiency and conservation programs. NIPSCO currently provides $1 million in annual funding for these programs and will provide an additional $1 million in funding for future extensions or enhancements to the programs within 30 days following the issuance of the order approving the settlement. The settlement addresses a number of additional natural gas rate related matters, including revision to NIPSCO’s depreciation and amortization expense levels, regulatory treatment of Alternative Regulatory Plan (ARP) revenues and other items. NIPSCO, with headquarters in Merrillville, Ind., is one of the nine energy distribution companies of NiSource Inc. (NYSE: NI). With more than 712,000 natural gas customers and 457,000 electric customers across the northern third of Indiana, NIPSCO is the largest natural gas distribution company, and the second largest electric distribution company, in the state. NiSource distribution companies serve 3.8 million natural gas and electric customers primarily in seven states. More information about NIPSCO is available at http://www.nipsco.com. NI-F. The Indiana Office of Utility Consumer Counselor (OUCC) represents Indiana consumer interests before state and federal bodies that regulate utilities. As a state agency, the OUCC’s mission is to represent all Indiana consumers to ensure quality, reliable utility services at the most reasonable prices possible through dedicated advocacy, consumer education, and creative problem solving. To learn more, visit www.IN.gov/OUCC .